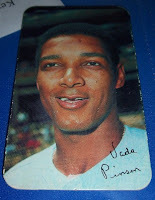 Indians Baseball Cards: What a bunch of oddballs! What a bunch of oddballs! I have to admit, I use the term "baseball card" very loosely when it comes to my collection. In reality, I collect Indians "items." Now, I generally do not collect bobble-heads, baseballs, etc. Most of my collection entails "flat" items, such as my most recent addition - a 1944 press photo (complete with credentials on the back) of Jim "Mudcat" Grant (not pictured, sorry). 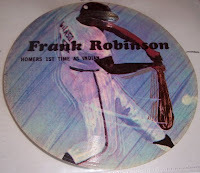 Another unique item I have is a record which has an interview with Frank Robinson getting his first home run as an Indian. Other "oddball" items I have include things like "Baseball Bucks," Crane Potato Chips discs, stand-ups, punch-outs, rub-offs, stickers, etc. When trying to organize my collection, I began to run into the issue of "defining" exactly what an 'oddball' item really is. Well, I suppose I could have forgone the whole mess by simply including my 'oddballs' with their respective year folders (thus, the 1977 discs would appear in the 1977 folder instead of the 'oddballs' folder). But, I wanted to have a separate folder for some of my more 'unique' items. The problem I ran into was deciding what was an oddball and what was more-or-less an extension of an existing set, and what should be considered a set period! So, I picked a number out of the air. That number is 4. If I have a collection of items of the same year and type (1977 Pepsi Cap Liners, for example), then I look at how MANY I have. If I have less than four (or if there is a pre-existing checklist in my database or I find a team-based checklist in a book or online), then those "fewer than four" sets go into the 'oddball' binder for its corresponding year. If there are four or more cards, then I put them into the binder for that year with the "regular" cards. My plan worked for about 10 minutes. Soon, I found myself putting off-brand, weird items in with "regular" issues ("regular" being defined by me as Topps, Upper Deck, Fleer, Donruss, Score, etc - major players). And, I found myself torn between placing things like a 1986 Topps Glossy Send-in. 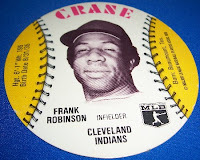 There are only 1 or two in the Indians "set," so is that an oddball item or do I put it with the regular issue cards because it *IS* Topps, after all? Since the organization of my collection is mainly for my own benefit, I figured I would just do what I felt like doing. I made the rules, I can choose to follow them, break them, or bend them as needed. So far, it has worked out fairly well. The only time I have a problem is when I discover a card have to file that fits into the "break/bend the rule" category. Because then I have to look in the "oddball" binder AND the year-specific binder. Granted, it is not a big deal, but has led to some interesting placements of cards (not to mention a few strange conversations with myself). 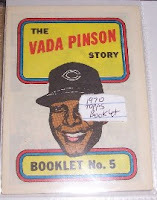 Ultimately, the way I see it is that if a company took the time to make more than 3 Indians in a particular set, then that set is worthy of a place in the binder with its year marked on it. No matter where an oddball item ends up, as long as it's in my collection, I'm happy to have it!